Modern construction has become more efficient and streamlined than ever, reducing waste and maximizing output for a variety of residential and commercial projects. In order to keep up with the high demands of our fast-moving industry, many contractors and subcontractors have specialized in providing turnkey services to ensure that their work provides the most value for customers. Structural steel fabrication, for example, has evolved to become a multifaceted profession, requiring experts to deliver a wide range of services from start to finish. Sanilac Steel is proud to be your trusted steel fabrication company, and we understand the modern demands of every project we set foot on. Steel fabrication is more than simply creating the metals needed to build an ideal structure — today’s projects expect contractors to provide the design, analysis, and installation services needed to round out the process of steel construction. Today, our structural steel fabricators in Michigan will highlight what our services entail, as well as the value that our team can provide for your site. When you are finished reading, be sure to call us at (989) 394-0672 or contact us online for assistance! Structural steel needs to be precise in order to achieve an ideal outcome. Up front, structural steel fabricators will be expected to analyze and interpret the drawings provided to them for a specific product. Our steel fabrication company relies on highly experienced individuals to accurately disseminate the needed information in order to produce a precise outcome that performs to its expected design strengths. Clearly understanding the demands of each unique build is essential for delivering an ideal outcome. Without proper planning, your project runs the risk of encountering numerous bumps and setbacks. Fabricating a piece in the wrong size or shape may result in costly delays, which is why it is important to find a company that knows how to get the job done. If you’re looking for a trustworthy team of steel fabricators, Sanilac Steel is here and ready to get to work. Steel fabrication has evolved to become a complex process, relying on a variety of production techniques to deliver the personalized results demanded for each build. Our steel fabrication contractors are here to deliver the highest level of quality for every application, ranging from steel staircases for towers and tanks to ornamental metal work, full-structure applications, and more. Your project may require unique processes and custom components, and Sanilac Steel is here to help. Shot blasting — The fabrication process relies on this protocol, which relies on small steel beads to blast away any impurities in the metal. Shot blasting is beneficial because it cleans the surfaces and prepares them for welding, painting, and other services. Cutting — Consisting of cutting the steel down to size prior to fabrication, steel cuts are completed by various techniques to make the process more efficient. Bending — Modern steel structure design relies on advanced curves and bends to perform amazing feats of architectural engineering, making it essential for fabricators to bend the metal as needed. Coating — The material coating structural steel is what helps to defend it from problems such as corrosion. Builders can change the color or protective properties of steel throughout the fabrication process. 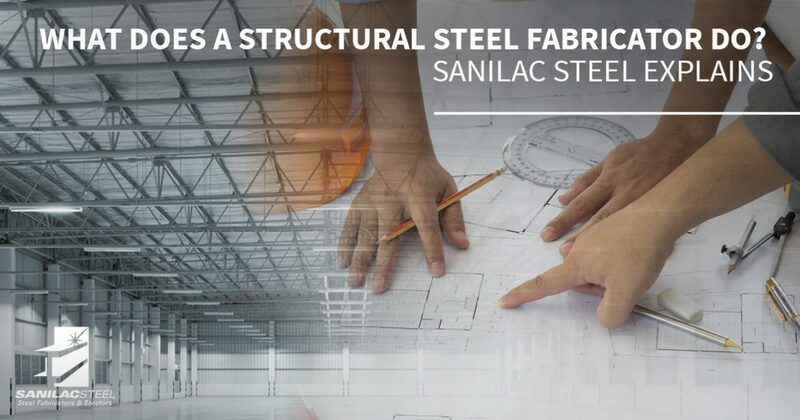 While structural steel fabrication consists of analyzing plans, producing an efficient process, combining parts and components, and fabricating all needed elements, all of the hard work will be for nothing if the building is not assembled correctly. Our steel contractors are trained and experienced in steel erection services, delivering complete results with the use of trained personnel and resources. This process entails the proper bundling, packaging, and shipping of these components to the site, where they will be offloaded and prepared for installation. Our team is here to help, delivering services such as our crane rentals for complete project solutions. Sanilac Steel is proud to deliver trusted steel erection services in Marlette and beyond, providing ideal outcomes for projects ranging from small bridges to long-span buildings, high rises, and more. Contact us today to learn more about our complete approach to steel fabrication, and be sure to request your no-hassle project quote!